Looking for something new and fun to do this Fall? Vermont is more than just skiing! I love the Fall and Halloween has to be my favorite holiday! My family and I spent some time in Killington during Spring Break and had a blast skiing. We have been planning on returning and this event is the perfect opportunity! Won’t you join us in the Fall fun? Killington WitchCraft is a fall festival that’s a scary amount of fun for everyone. Be the first to be a part of a tradition you’ll look forward to and never forget. 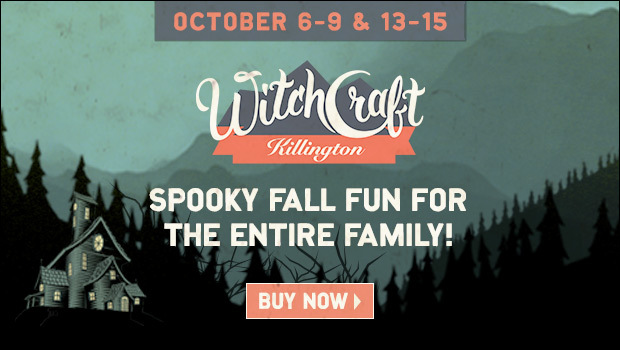 Killington WitchCraft has something for everyone! Enjoy guided ATV tours of the mountain, challenge your family to a race through the haunted maze, or sit back with a craft beer and listen to live music. Come out and join us for a weekend full of activities for the whole family. Killington WitchCraft is a fall festival that’s a scary amount of fun for everyone. Held two weekends, October 7 – 8 and October 14 – 15, activities include hay rides, a haunted house, pumpkin launch, craft beer, and more. Save up to 20% on lodging. PLEASE NOTE: Lodging prices do not include WitchCraft event tickets. Ticket prices and more details to come. Disclosure: I am a US Family Guide blogger and will be receiving passes for this event for myself and my family. All thoughts belong to me! This sounds a great festival. Halloween is mine favorite holidays as well. Fall festivals are so much fun, and I bet the scenery is gorgeous there. The haunted maze would probably freak me out a little! I would love to attend this fall event however I am afraid of witchcraft and my religion doesn’t allow it. Bet they will have lots of other options. Besides I would love to visit Vermont. IT’s just called “witchcraft” because of the Halloween season. Plenty of things to do on the adventure track! It truly is a beautiful place! Oh this sounds like so much fun! We love Halloween and are always looking for fun things to do and place to visit. I’ll need to check this one out! I’ve always wanted to visit Vermont especially this time of the year! Fall and Halloween festivals are so much fun! This sound like a lot of fun! I love fall festivals. Craft beer, hay rides, and a haunted house? My family would sure love to go.